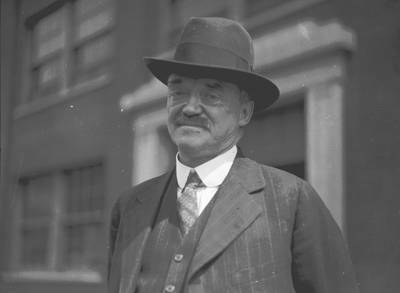 "C. Francis Jenkins, founder of SMPE"
C. Francis Jenkins [1867-1934], founder and first president of the Society of Motion Picture Engineers, outside, wearing a hat. He was an American pioneer of early cinema and one of the inventors of television, though he used mechanical rather than electronic technologies. His businesses included Charles Jenkins Laboratories and Jenkins Television Corporation (the corporation being founded in 1928, the year the Laboratories were granted the first commercial television license in the United States). Over 400 patents were issued to Jenkins, many for his inventions related to motion pictures and television.